If you're a blog owner or site owner who has already monetized their site with the help of Google Adsense, but you're not quite sure what content brings in the big bucks or would like better reporting in order to improve your content monetization. Then the very first step is to import AdSense data into your Google Analytics account. Google AdSense has made ad management for the independent blogger an easy and painless process, and even though you may not be dealing with the technical optimisation side, there are still ways you can improve your earnings. By tracking site performance and gathering regular data on which content brings in your visits, where your visitors come from and what they spend their time reading can be invaluable for any sites content strategy. Note: You should be logged into Google Analytics and Google AdSense with the same email account. Navigate to Property, and underneath that section, you should find a section called "Product Linking." Click continue, and that should be it, congrats! You're now connected! 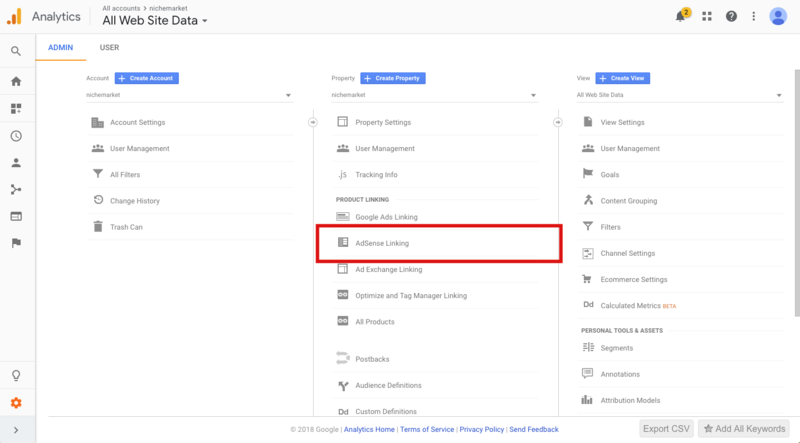 Once you've successfully connected your AdSense account with your Google Analytics account all you need to do is log in to your site profile in GA. The drop down should default to the overview tab, and you will now have access to 2 additional reports. These reports are called Publisher page and Publisher referrers. This may seem like a simple report, but it will provide you with vital information you can use to refine your content strategy. Instead of creating content without reason or rhyme you can now review what content actually pays you the most and double down on those sorts of posts. You can also use this report to find out what kind of traffic pays you the most so you can focus on key channels and make sure you're building a consistent income stream through monetised traffic.